Washington, D.C. -- During a live primetime televised interview with Fox News' Bret Baier, Reza Pahlavi of Iran condemned Mr. Ahmadinejad's repeated comments on the holocaust and ailing Ariel Sharon as "despicable," having set a "new standard on incivility and disgrace," and "rejected by the vast majority of the Iranian people." Observing that Jews and Persians had "for millennia lived peacefully together," the 45 year old opposition leader to the clerical regime reminded the audience that the first Shah of Iran, Cyrus the Great, is revered as a 'savior-saint' of the Jewish people. "Obviously Mr. Ahmadinejad is ignorant of our heritage. He is unfit to be "called an Iranian or a statesman for that matter." "Until today the international community had based its foreign policy on a false assumption that the clerical regime wants a diplomatic settlement," said Reza Pahlavi. "History has proven that fascism can not be negotiated with," warning that the clerical regime was "set on, and desired a collision with the west" � to justify its militarization, especially nuclearization, and to distract its brewing domestic distress. "Time has come for regime change in Iran," asserted Reza Pahlavi. Citing increased growing unrest within Iran, he attributed the increase in defiant acts of civil disobedience reported in Iran, in the form of strikes and sit-ins, to a powerful force of 50 million, Iran's youth, which "desires nothing less than modernity, freedom and economic opportunity." For this to happen, Reza Pahlavi said, "the free world must unambiguously declare its support for the Iranian people's rightful quest for regime change." Reza Pahlavi, who has been leading a campaign of political defiance against the theocracy in Iran, is the former crown prince of Iran. He is an accomplished jet fighter pilot, graduate of U.S. Air Force training program and the University of Southern California. Author of 'Winds of Change, The Future of Democracy in Iran', he is married and father to three daughters. At this critical moment in our history, it is absolutely essential to mobilize all our forces and strengthen the opposition leadership in order to free our homeland. There are many Iranian groups and democratic organizations that they are working hard and making sacrifices for freeing our homeland in order to replace the Islamist regime with a free society and secular democracy. The world has changed and time of promoting only one person as a leader of very complex Iranian oppositions and 70 million Iranian people as a hostage to the Islamist regime can not be acceptable solution for many Iranian opposition groups and individual activists. In these circumstance the important decisions should be made through team effort. Now with the above introduction, we are suggesting if Her Majesty Shahbanoo Farah Pahlavi, Prince Reza Pahlavi, Prince Ali-Reza Pahlavi, Princess Farahnaz Pahlavi agree, then they might consider creating an Iranian Leadership Royal Family Council with each selecting 4 or more independent advisers from other opposition Iranian groups or individual activists as counsel and members of the Royal Family Council. Together they can define the Council�s responsibilities, conduct fundraising activities and engage in important decision making for freeing our homeland faster. In order to create more unity and a powerful network among the Iranian Groups, the royal family members also should consider accepting advisory positions in other groups. This mesh networks will not only provide the royal family with a vehicle for greater participation, but also provide the opposition with a means of greater collaboration with the royal family in order to increase unity and collaboration across the board. We think Her Majesty Shahbanoo Farah Pahlavi should be considered as the head of the Royal Family Council. If the Royal Family Council is formed and respected advisers are selected, then I am sure that many opposition groups, Free Iran individual Activists, ActivistChat members welcome active participation of all the top royal family members and their selected independent advisers. Due to the fact that the majority of Iranian people live in California it might be better if the Royal Family Council consider opening their permanent offices in Southern California until Iran is freed. 1. Territorial integrity and national sovereignty of Iran. 6. The �War On Terror� is UNWINNABLE and the world peace can not be achieved as long as the Unelected Islamists Terror and Torture Masters are in power in Iran. The terror state and fear society can not create stability. 7. Iranian people can decide about Nuclear Energy and Atomic Bomb after the regime change when they have established secular democracy and Free society until then Iran can not have any kind of Nuclear research program under Islamist regime control. This is one of the way to create a critical mass faster, get closer to the FREE IRAN Inflection Point, establish free society and secular democracy with minimum bloodshed. This is an open forum suggestion for ActivistChat members discussion, enhancement and public awareness. Thank You Reza Pahlavi !!! POTOMAC, Maryland -- The exiled son of Iran's late shah on Monday called on the Bush administration to put action before rhetoric in ousting Tehran's Islamic regime, which he said has long been the source of global instability. Reza Pahlavi, 45, the eldest son of the late Mohammed Reza Pahlavi, said Iranians are ready to actively oppose the Islamic regime of Iranian President Mahmoud Ahmadinejad, but need more than pro-democratic utterances from world leaders like U.S. President George W. Bush. "Fantastic, we love to hear that, motherhood and apple pie," Pahlavi said of Bush's statements that the United States supports a free, democratic Iran. "What remains to be seen again is in what concrete way the U.S. administration will take the necessary steps," Pahlavi told Reuters in an interview at his home in a suburb of Washington, flanked by the Iranian flag and portraits of his mother and father, the U.S.-backed monarch who was deposed in the 1979 Islamic revolution. The United States and other nations should actively support Iran's dissident groups and give them the technical gear and expertise to get their message out, Pahlavi said. Pahlavi said regime change in Iran will leave the Middle East a safer place, and said that Iran's clerics have long been a prime mover behind violence in Iraq, Lebanon and Sudan. "For 27 years we have seen the world sending their firetrucks to try to extinguish fires all over the planet," he said. "But nobody has asked the question 'Who is the main culprit?' ... When you come to think of it, it has been Tehran all along." The United States and Iran are at odds over Western accusations that Iran's nuclear program is a cover for making weapons. Iran says it wants to use the enriched uranium for electricity generation. Pahlavi, who trained in the United States as a jet fighter pilot, said Iran has the right to nuclear technology, but not to threaten other nations with it. "It was never a question of Iran having the right -- the problem is the finger on the trigger," he said, referring to Ahmadinejad's public calls for Israel's destruction. However, Pahlavi said the United States should not pursue military means to take away Iran's uranium-enrichment capability. Bush has said military options are on the table but has stressed the need for diplomatic talks. Instead of a military strike, Pahlavi said global leaders should help Iran dissident groups' overthrow the current regime from within. There seems to be no way to settle the "Iranian nuclear crisis", despite all efforts by the international intermediaries. Tehran and Washington keep exchanging bellicose statements, increasingly more threatening. Is there a way out of the impasse? Will the U.S. use force against Iran and if it does, what will it lead to? How long will the present regime in Tehran be able to cling to power? Answers to these and other questions were supplied by the man who, under certain circumstances, could be heading Iran today (as arguably he will soon). This conversation with Mr. Reza Pahlavi, the son of the Shah of Iran deposed in 1979, was held by Nadezhda Popova. Izvestia: Just recently, you stated that by July-August you will have formed a movement with the purpose to overthrow the current regime in Tehran. How are you planning to accomplish this revolution? Reza Pahlavi: We are calling on Iranians for mass actions of civil disobedience. Meantime, we demand of the international community that it should apply sanctions in a way that would punish the regime but not harm the people. For example, members Mahmoud Ahmadinejad's government may be declared personae non grata. When the regime has been debunked, we will arrange a nation-wide referendum to have the Iranian people decide on their own the political future it wants for itself. We will conduct a democratic election. The parliament will draft a new constitution. Izvestia: Who is going to participate in these acts of civil disobedience? Reza Pahlavi: There are numerous opposition groups in Iran, bringing together workers, intellectuals and other social strata. Almost 50 million of the country's 70 million population are young people under 30 years. They have access to information about what is going on in the world. They understand just how bad are the things now occurring in Iran. I think soon my countrymen will realize that the present regime does not care about ordinary people but cares exclusively for itself. Besides, we have opposition cells throughout the world, since many Iranians left their homeland after the revolution. With them, as well as with the opposition inside the country, we are in close contact. Izvestia: Can the West, in your view, strike a military blow on Iran? Reza Pahlavi: I do not rule this out. But the war would have horrendous consequences. What we now see in Afghanistan and Iraq must teach us a lesson. The Iranian problem has a peaceful solution to it. Izvestia: How will Iran's Kurdish and Azerbaijani communities respond in the case of a war conflict? Can they declare their will to secede? Reza Pahlavi: Sure. The current regime is trumping the Shiite-Sunni card, pitting national minorities at each other's throat. However Iran is a country which for centuries accorded welcome to people of different nationalities and faiths. So when we come to power, national minorities will have their rights guaranteed. The present regime creates too many complexities like terrorism, economic instability, nuclear menace, extremism. When it clears the stage, 90 percent of world problems will be resolved. Izvestia: What is your personal stake in this? Reza Pahlavi: We want the West to help us build democracy. To a certain extent, it is even more important than battling the nuclear weapons in Iran. Izvestia: Which countries are you talking with? Reza Pahlavi: The U.S. and Europeans. With all those who believe in the Iranian people's ability to resolve the problem. Since all other methods will be more risky, more dangerous and, simply speaking, more expensive than what I am suggesting. Izvestia: Could Americans wager on you as the future head of state if they decide to support the Iranian opposition? Reza Pahlavi: I talk with the republicans as well as the democrats. People in the US understand that by bolstering democracy in Iran they invest in the bright future for the whole region. I think only of how to help my motherland. My role is modest indeed. And it does not matter whether we will have a monarchy or a republic and who will head the state. We will decide these later. Izvestia: Did you have contacts with the Russian government? Reza Pahlavi: No, regrettably. But I am ready to call on the Russians to try and dissuade Ahmadinejad from having a nuclear program, and pay attention to our people. After the end of the cold war Iranians' attitude to your country was completely changed. While the USSR threatened our national interests, Russia is a friend. The last Shah of Iran Mohammad Reza Pahlavi was enthroned in September of 1941. He restored the authority of parliament and carried out liberal reforms. Everything changed, however, after the February 4, 1949 attempt on the Shah's life. Mohammad Reza declared the state of emergency and switched to an authoritarian regime. Since January of 1978 when the Shah's troops shot at participants of a protest action in Qum, the country was swept over by a wave of demonstrations against the monarch, organized by the clergy. On January 4, 1979, Mohammad Reza authorized opposition leader Shapour Bakhtiyar to form a new government. But very soon power passed on to the clerics headed by Ayatollah Khomeini who promulgated the Islamic Republic. On January 16, 1979, the shah with his family left the country. By that time Reza, the eldest of the monarch's three sons, had already lived abroad. He went to America in 1978. After completing the course at the Air Force Academy, he entered the depar! tment of political sciences at Williams College. Then he graduated from the University of California. Now Reza Pahlavi lives with his wife and three daughters in Maryland. که خود را " جمهوری اسلامی " می نامد ، ميسوزد و ميسازد. در صدد زدودن هويت قومی و ملی افتخار آفرين يک يک ما بر آمدند. ،تر کمن ، عرب و فارس ميباشد! چو ايران نباشد ، تن من مباد! جانانه ايستادگی و پايد اری کرد. حس ميکنم بايد در همين فرهنگ مهر آفرين و آئين همبستگی فرازمند ملی شما جستجو کرد. ما با همين فر هنگ و همبستگی بر بيداد ها و شرار تهای رژيم کنونی فائق خواهيم آمد. همای فرهنگ ملی ما دو بال دارد که با آن بپرواز شکوهمند خود تواناست : هويت قومی و هويت ملی! و نشان و فر هنگ ستيز " اُمت " تفاوت ماهوی دارد. بسوی برادرا ن و خواهران آذری ، کرد ، بلوچ و غيره رها ميشود ، به جان بخرم! ايران ستيز به زنجير کشيده شده و به زندانی بزرگ مبدل گشته است. زندان را با نيروی جمعی خود فرو د آوريم ! حاکميت خونين و جنايت بار خود را بر سا حت کُهن ميهن ما گستر ده اند ، سا ز مان دهيم! معامله نها ده اند ، خسته شده اند! من بر نامه مبارزاتی خود را با " الهام از منويات قلبی ملت ايران"
اتحاد ، پيروزی ، آزادی ! و نمی خواهند برای هميشه با من هم پيمان و همراه خواهند بود! P.O. Box 566, Falls Church, VA. 22040, U.S.A. It's been an agonizing week for Iranian patriots. On Monday, Washington's ambassador to the U.N., John Bolton, suggested that if Iran's ruling clerics abandon efforts to make nuclear weapons, they can remain in power. Thursday brought another jolt, when U.S. Secretary of State Condoleezza Rice said that the U.S. would join direct negotiations with Tehran if Iran verifiably halt its weapons program. In one fell swoop, it seems, the U.S. not only committed itself to a course that is certain to fail. It blundered into the one strategy guaranteed to strengthen the revolutionary regime while simultaneously undercutting the only force capable of stopping it: the Iranian people themselves. At least, that's what I thought Reza Pahlavi would say when I telephoned Thursday for a comment on Secretary Rice's statement, following up on a long conversation we had in person last week. But Mr. Pahlavi, perhaps drawing on diplomatic skills he's honed in the quarter-century since his father, the shah of Iran, was deposed in 1979, gracefully called it "overall . . . a good move by Washington." The reason? "It will once and for all force Tehran's hand," and show that "the clerical regime is irreversibly committed to its dual-use enrichment program; that it will seek to stall for time, by following a pattern of deceit and duplicity; that at the end, it will prove its untrustworthiness and incapacity to become a reliable partner in diplomacy." But then Mr. Pahlavi brought up the alternative strategy which Iranians, at home and abroad, have been urging deaf Western policy makers to adopt for years now: "That can only be internal pressure on the regime . . . support for proponents of democracy and human rights in Iran. There is no other answer." Mr. Pahlavi should know, and not only because he is the son of Mohammed Reza Pahlavi, who for a time made Iran the linchpin of Middle Eastern stability and set his country on a course toward modernity and prosperity. The famous name helps, but so, for instance, does the Internet. From his home in a Washington suburb where I visited him last week, Mr. Pahlavi is in constant contact with people all over his homeland, including curious students who turn to him as a link with a more liberal past and also to exchange thoughts about a democratic future. In short, Mr. Pahlavi easily grasps what the rest of the international community refuses to understand or to acknowledge. "There is no incentive that we can give the Islamic Republic to stand down," he told me over Memorial Day weekend. "They need to do what they're doing, first and foremost because this is a totalitarian system. It has to keep the mood on the streets in its favor by continuing this process. If they are using the slogan of enrichment as a tool to keep these people mobilized, the minute they concede, they will lose their entire praetorian guard. Therefore there's no way that they are going to concede on that point." The threat of sanctions or the promise of aid won't budge the regime either, he says. "There is no economic incentive that you can throw at them, because you are not dealing with a conventional state, in the sense that it is ultimately accountable and responsible and cares about the citizens living in that boundary. It's not the welfare of the people that matters to them. They can send $100 million to Hamas in Palestine when people are starving on the streets of Iran. They could care less about their economic status, so long as they can fuel their own war machine. "You cannot even offer them a security guarantee, they don't care. For them, war is a gift from God. [President] Ahmadinejad is talking about Armageddon. He's talking about paving the way for the reemergence of the 12th imam, which is coming back to the planet to bring back stability and peace after major cataclysm. They really believe that." Until that happens, the prospect of negotiations with the U.S. is a little godsend for the regime, Mr. Pahlavi explains. Iran's rulers can say, "Look at us! We're standing against the Great Satan . . . and guess what? We have brought them to their knees, we have brought them to the table." As for Tehran's end game, that's simple: "Ultimately, what is the grand prize for them? They would like to achieve something the Soviets never could -- the control of the Middle East. The economic lifeline of the Western world. By encircling the Persian Gulf, by institutionalizing themselves, with their proxies operating everywhere, and in a fait accompli-type scenario, force the world to reckon with them. Naturally, if they ultimately get the bomb, their deterrent will be even more dangerous." Mr. Pahlavi, who is 45, has seen danger in his own life. He was at school in the United States when his parents left Iran, but joined them in exile and, after his father died in Egypt in 1980, became a target himself of the new regime's vilification campaign. Today, although he does not advertise his address, he doesn't surround himself with bodyguards. Inside his airy and attractive house in Maryland, pictures on a side table of his regally attired father and mother are the only obvious signs of his unique heritage. Mr. Pahlavi is so focused on the future of Iran that he prefers not to spend time on the past. Even so, when I ask what might be different today if the Iranian revolution had never taken place, he points to a chain of events that seem even worse with hindsight than they did at the time: "The Russians probably would not have invaded Afghanistan the way they did, and Saddam Hussein would not have attacked Iran. . . . From Sudan to everywhere else you can think of, there have been acts of terrorism, attacks on apartments in Khobar, the blowing up of Marine barracks in Beirut. It's been all over the place. If you look at the world the way it was before this regime took over, we didn't have any of these problems." And yet a solution to all of this is percolating up today, Mr. Pahlavi says, and it's coming from the Iranian people. In fact, he insists, in dealing with a belligerent Tehran, "there is only one thing that the outside world can do, and that is to tell the regime: 'We are serious about supporting the people who are inside Iran who are against you.' That is the only thing that will make Mr. Khamenei [Iran's supreme leader] and everybody stand down. Because nothing else ruffles them. The only thing they are really scared of are the people themselves." Peaceful revolutions from within have worked before, so why, he asks, isn't the West investing in the Iranian people -- "the same way they supported so many movements in Eastern Europe that ultimately brought down communist governments that were under Moscow's umbrella?" Dissidents are everywhere, in the universities, workplaces, the conventional armed forces, he adds: "There are thousands of cells . . . each trying to bring as much pressure as they can -- but with very limited resources. Imagine the cumulative weight of all these resistance groups in a civil disobedience act -- nonviolent, we don't believe in violent change -- that could begin sustained pressure to the point of paralyzing the system until it would collapse." "They want to have justice, they want to have equality, they want to have freedom of speech, they want to have a better life, they want to be connected to this progressive world, they like modernity. . . . And they know that the only obstacle between them and the free world is this regime. When you talk to young students today, they say: 'We don't have any more fears. We are out there, we are fighting -- all we need is the support and recognition because that is going to prompt even more action inside Iran.'" Helping opponents of the regime inside Iran does seem like a smart option, especially when you look at Iraq today -- and then imagine how much better it would be if Saddam had been replaced by Iraqis who had already decided to pull together for a common cause and similar goals. It's also a far less precarious and destructive option than a military attack on the current regime or its nuclear sites. Mr. Pahlavi is horrified by the thought, and not only because he loves his country. He can come up with plenty of other objections, beginning with the fact that Iran's top ayatollah and the rest of the regime would be the only beneficiaries: "I think Mr. Khamenei is sitting there praying and hoping that such an attack would occur. Because it would play right into their hands: They can call another jihad or it would give them every excuse in the book to deflect attention yet again [from their failings]. It would be the greatest gift you could give them." Besides, he continues, "nobody in this world really believes that a full-scale military attack on Iran is foreseeable. Tanks marching all the way to Tehran -- impossible. Limited air strikes at best. [And] it wouldn't achieve anything except infuriate the people; . . . you would lose many nationalists, who would say: 'This is an attack on Iran, not defiance of the regime -- you want to hurt the regime, why don't you put sanctions on the regime? Keep their diplomats from traveling. Why don't you go and block and freeze all their assets and bank accounts and dummy companies that they operate through and [use to] transfer money to their cronies?'" Why not indeed? Mr. Pahlavi says he is no enemy of diplomacy. What he can't figure out is why so much time and effort has been focused on Iran's rulers, while so little attention and support has been directed to the Iranian people. As he emphasizes every chance he gets, "It's not by sending the Sixth Fleet and annihilating the entire Iranian navy that anything is going to be achieved, not to mention the loss of lives. It's going to be by helping the people on the streets. . . . They are the best army that can fight against this evil and remove it from the planet." By the way, Mr. Pahlavi says that in a democratic Iran, he would be honored to assume the title of shah in a parliamentary system, but only if the Iranian people ask him to. He already has at least one vote. On the way to meet him at his house, the nice lady who drove me there quite naturally referred to her boss as "His Majesty." Ms. Smith is a member of the Journal's editorial board. The person right behind Shah in the picture of coronation, on his right side, ironically was the most trusted Shah's friend & military man. Yes, it's him, the traitor General Fardoost, he betrayed his countrymen and his king. Everyone, please remember this face, because someday I hope he will pay for what he has done to Iran. Under "Main Targets of the IIRF" you will see the more youthful picture of traitor Fardoost. The exiled son of Iran's late shah has sharply criticized diplomatic negotiations by the West to persuade Tehran to abandon its nuclear program. Reza Pahlavi held a press conference Wednesday. The oldest son of late Iranian shah Mohammed Reza describes diplomatic dialogue with Iran as a lose-lose situation. Pahlavi, 45, says the United States and Europeans will get nowhere in their efforts to coax Iran to abandon its nuclear program through dialogue. He says these negotiations only strengthen the hand of hard-line conservatives in Iran. Instead, Pahlavi says the United States and the European Union should support popular opposition within Iran as the only way to change the current government. Tehran, he says, has nothing to gain from talking with the West, except to buy time as it builds a nuclear weapon. "It simply puts the regime in an impossible position. If the regime accepts to put the seals back on the centrifuges and halt enrichment of uranium, it will have to take back the mainstay of its propaganda directed to its domestic and global Islamist allies and the ideological glue of its security forces," he said. Pahlavi's remarks Wednesday followed reports Western officials are now asking Tehran only to suspend, rather than stop altogether, its nuclear enrichment program while negotiations continue. Those talks include new Western incentives, delivered this week by European Union foreign policy chief Javier Solana, for Iran to end the enrichment. Iran insists its nuclear program is for peaceful purposes, but U.S. and other Western governments fear it is trying to build a nuclear weapon. Pahlavi, whose father, Iran's last shah, was deposed in the 1979 Islamic revolution, lives outside Washington, D.C. He is one of a number of Iranian opposition leaders living in exile. Until now, that Iranian opposition has been fragmented. But Pahlavi describes a sea change in the diverse coalition of opposition forces, which is now rallying together. "It may have been true that in the past the opposition was more divided between themselves as opposed to being opposed to the current regime. But that has changed." Pahlavi says the only exiled opposition group that has not joined forces is the prominent, and very controversial, Peoples Mujahedeen of Iran. PARIS, June 8 /PRNewswire/ -- Reza Pahlavi of Iran, having met earlier in the day with 39 French Parliamentarians, held a press conference at the Foreign Press Club (Le Cape), during which he declared "the latest offer made to Tehran a lose-lose proposition for the Islamic Republic." Indicating that the new offer, initiated by the US administration, had shown that the regime had put itself in an impossible position, he explained "if the regime accepts to concede and put seals back on its centrifuges, permanently halting its enrichment program, it will loose the main thrust of its propaganda." This, he added, "would unravel the ideological glue that keeps its Islamist allies and security forces together." Alternatively, he argued, "if the Islamist regime rejected the new US offer, its already anemic economy will face an unsustainable, back-breaking shock." Fielding questions in French, English and his mother tongue, Persian, the 45 year old political leader pointed out that the regime had already, repeatedly, rejected any chance of accepting IAEA seals disabling its centrifuges. Missing from the Iran debate, he argued, is a credible and accurate understanding, by the international community, of the true nature and goal of the clerical regime. "The raison d'etre of the regime, as codified in its constitution, is to spread the 'rule and law of God' throughout the world," underscoring that "the regime's hope at winning an equal seat at the negotiating table is for grandstanding against the free world, not to join it." Accentuating that lack of understanding, he predicted that the new US offer, in fact, stands a good chance of being viewed as a vindication of the most hostile elements within the regime. Tehran will deduce that while the mild-mannered former President Khatami could not manage to engage the U.S., "Mr. Ahmadinejad's harsh and venomous rhetoric brought the toughest US President, in the life of the Islamic Republic, to the table." The will enable Iran's ambitious clerical revolutionaries to use "the lesson that harshness and radical talk pays, trumpeting it to regional radical Islamists, encouraging them to chide moderate leaders as spineless cronies of the West." On Wednesday morning, Reza Pahlavi was received by 39 members of the National Assembly of France where he discussed issues relating to Iran, specifically the clerical regime, its conflict with the Iranian people and most recent developments in opposition politics. Later, he also met with former Prime Minister Eduard Balladur, currently President of the Foreign Relations Committee of National Assembly of France. Reza Pahlavi is leading a campaign of political defiance against the radical Islamist regime of Iran. He is the former Crown Prince of Iran, an accomplished jet fighter pilot, having graduated from the U.S. Air Force training program, and has a degree in political science from the University of Southern California. Author of Winds of Change, The Future of Democracy in Iran, he is married and father to three daughters. 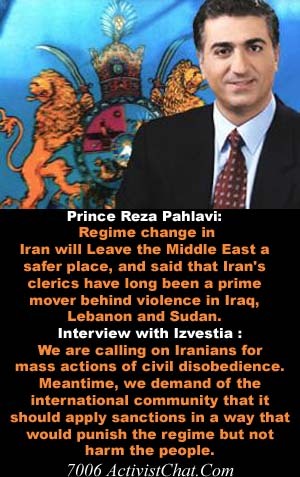 Prince Reza Pahlavi, eldest son of the last Shah of Iran wants to bring down the regime of the Islamic Republic. In an interview given to the Figaro yesterday, he calls on his compatriots to begin a campaign of non-violent civil disobedience. At the same time, he is trying to unite the opposition in exile under a �secular and democratic� platform. The Prince was received yesterday at the National Assembly of France. Reza Pahlavi: � Let�s start a campaign of civil disobedience � In an interview with the Figaro newspaper, the heir to the Iranian Imperial throne calls upon western countries to support the establishment of democracy in Iran. The 45-year-old Prince Reza Pahlavi, who lives in exile in the United States, is the eldest son of the last Shah of Iran. He hopes to unite the democratic and secular opposition to the regime that sized power in Iran following the victory of the Islamic Revolution in 1979. Passing through Paris, he met yesterday with around 40 MPs at the Palais Bourbon (French National Assembly) to speak about the Iranian nuclear crisis. For him, neither diplomacy nor military action but only a popular uprising in Iran can bring an end to the conflict. Figaro: Does Iran have a right to the nuclear weapons? Reza PAHLAVI .- The problem is not technology. Before the revolution of 1979, Western countries sold nuclear technology to Iran. Today we are face to face with a totalitarian regime that supports terrorism and promotes a radical vision of Islam. Access to the nuclear weapons would enable this regime to fortify its position in the region and to establish control on both banks of the Persian Gulf, as well as over the flow of oil. In this way the regime would be able to achieve what the Soviet Union never succeeded in accomplishing: controlling of the world economy. The nuclear weapons would guarantee the survival of the regime. Can the offers made by the great powers help to defuse the crisis? No, because the regime has everything to lose by such an offer and nothing to gain. To stay in power, the regime needs to maintain its radical stance. A retreat on the nuclear question would mean an endangering of its cohesion. On the other hand, turning down the offer would lead to international sanctions, which would worsen the already bad economic conditions. It would also lead to suffering. Most foreign governments are wrong in assuming that they are dealing with a conventional state. For Iranian leaders, national interest does not mean anything, and accordingly the economic incentives would be ineffective. From their point of view, Hezbollah in Lebanon or Hamas in Palestine are much more important than the interests of the Sunnite or other minorities in Iran. Therefore you do not see the reaching of any possible compromise? It is very difficult for me to imagine that the regime would go back on its word; especially concerning the enrichment of uranium. It has been a war cry, especially since Ahmadinejad came to power. It would be political suicide for him to give in. Do you think that with the present leaders, negotiations are only in vain? Yes, for three years, the European troika has been involved in endless negotiations, without any result. I cannot see any possible carrot that would bring this regime out of irrationality. It is only biding its time to get closer to the possibility of making WMDs. The world is wasting its time. However, the Bush administration says it is willing to dialogue with Tehran. Yes, but by imposing certain clear cut conditions. In my opinion, the United States wants to show the world that it is not trying to solve the problem unilaterally, and at the same time is forcing Iran to choose an option. It�s a kind of ultimatum, with the aim of disarming those who are opposed to sanctions. The international community should therefore impose sanctions? I would go even further than that: everything depends on regime change in Iran. This regime is the key problem for our society, for the region and for the world. The best solution would be to put an end to it and invest in democracy. As long as this regime will exist, none of the main world problems, peace between Israelis and Palestinians, religious fanaticism, terrorism and the proliferation of WMDs will be able to be solved. It is a race against the clock. Will Iran become democratized before the regime gets the nuclear weapon? That�s where the crux of the matter is. The West must support democratic movements like it did in South Africa, in Eastern Europe or in Latin America. However, in Iraq, the imposition of democracy by force resulted in something near civil war. Comparing Iran and Iraq is like mistaking an apple for an orange! In any case, we are not asking for foreign intervention, which would be counter-productive. When after September 11, America discovered that they had a problem with Saddam Hussein, they forgot who was the main guilty party for fanaticism and radicalism. For the past 27 years the whole world has been sending fire fighters to put out the blazes. Some day or other, someone will have to take on the person who has the tinderbox: the Islamic Republic of Iran. Do you see any links between Iran and Al-Qaida ? Al-Qaida has even had training camps in Iran. And lots of Al-Qaida elements pass through Iran. Should the problem with Iran have been fixed before that with Iraq? I do not want to minimize the responsibilities of Saddam Hussein. But it must be seen that the majority of problems that the world is faced with today � the price of oil, terrorism, proliferation, and radicalism � are linked in one way or another to the Islamic Republic. The regime change you are calling for � should it come from inside Iran or outside? From the inside exclusively. The real power is inside. Thousands of groups in Iran are doing their best to begin a campaign of non-violent civil disobedience. They need a lot more means in order to succeed. That is why they need assistance and help from outside. We hope, as Iranians, that the world will finally choose its side: guaranteeing the survival of this regime or helping to bring about a democratic secular regime. Is it fair to say that France is one of those countries that support the status quo? I do not know if it is by design or not, but France, like Germany is one of those countries. Having said that, I note a beginning of a change of course. France too is faced with a choice: democracy or theocracy in Iran. There have always been links between my country and France. Today France can play an extremely important role and put back on the agenda an aspect unfortunately eclipsed: the moral aspect. Can the Iranian opposition that seems to be very divided, get organized? The Iranian opposition is united today. There has been a complete sea change in that direction recently. Last week a conference in London brought together representatives from very different political groups, in order to reach the same goal. Apart from the People�s Mujaheddin Organization, all the other groups now talk to each other. That of a catalyst and a unifying element, because �Unity brings about strength�, as they say in France. I hope for a secular regime, with a clear separation between clergy and State, founded on human rights. As for the final form of the regime, parliamentary monarchy or republic, it is for the Iranian people to decide. For me, I think a modern monarch could help to institutionalize democracy in a country like Iran, on the same model as the role of King Juan Carlos of Spain after Franco. My aim is to serve my nation. The problem is not technology. Before the revolution of 1979, Western countries sold nuclear technology to Iran. Today we are face to face with a totalitarian regime that supports terrorism and promotes a radical vision of Islam. Access to the nuclear weapons would enable this regime to fortify its position in the region and to establish control on both banks of the Persian Gulf, as well as over the flow of oil. In this way the regime would be able to achieve what the Soviet Union never succeeded in accomplishing: controlling of the world economy. The nuclear weapons would guarantee the survival of the regime. Having noted RP stance against hostilities, I cannot think that he could be unaware of the fact that open hostilities would ensue to prevent just the scenario he outlined, long before it became a matter of nuclear blackmail. Nor would internal measures taken by the opposition remain peaceful, there's too much prior evidence of the regime's violent reaction to uprising to think that it could be peaceful. More peaceful than military intervention perhaps, but anyway you slice it, the mullahs won't go quietly into the night. As the oldest son of the Shah of Iran, Reza Pahlavi's youth in Tehran's sumptuous palace � and his prospects for the throne � ended at age 17, when the 1979 Islamic revolution drove his family into exile. Between meetings with French politicians last week, Pahlavi, now 45, sat down with Time's Vivienne Walt in his mother's Paris residence to describe the best way to oust the Tehran regime � and return him home. How can the opposition defeat the regime? A campaign of civil disobedience is the only way to force the regime to retreat � national strikes, demonstrations, a refusal to cooperate. What [Supreme Leader Ayatullah Ali] Khamenei fears most is not economic sanctions or military strikes. It's people on the streets. But just a year ago, many voted for President Mahmoud Ahmadinejad? When you have a Robin Hood message, you can fool people. But at some point they get it. Don't forget the West was mesmerized by this smiling [defeated reformist [an error occurred while processing this directive]President Mohammed] Khatami talking about dialogue, while there were journalists and students in prison and newspapers were shut down. What's your role in this opposition? To be above the fray. Often I've witnessed cases where [opposition] people were not talking to each other, and they would come to me and I would somehow get them to talk. My modern role today is a national function. What do you want the U.S. and Europe to do? If there was a first item on the shopping list, it would be communication to bypass the regime's blocking of weblogs and so on. This could change the whole dynamic of what can evolve inside Iran. Communication has been very restricted. That explains why many movements like the labor strike, student protests and acts of civil disobedience have been limited and sectarian. If you can communicate with people, they can organize on a much more mass scale. Do the U.S. and its allies have any good military options? I cannot foresee any military action which could be feasible. The thought of foreign tanks rolling into Tehran is beyond imagination. No Iranian could tolerate an invasion. It would be an attack on our homeland. Even limited air strikes: if you want to alienate people, strike the first blow. How wide is the disaffection in the military inside Iran? A lot of people are stuck in the system and would love to find an exit. Of course the regime has goons, an army who are practically thugs who may go and hit people. But can they face millions on the streets? That, no. What about the latest incentives offered to Iran by the U.S. and Europe to halt its nuclear program? The focus has been so much on the nuclear issue that they have lost track of the big picture. If by some miracle, you can resolve the nuclear issue and you have quid pro quos of security guarantees for the Islamic regime, what does that mean? Giving the regime carte blanche? What about conventional terrorism? You were very young when you were exiled. Yes, I was 17�. Exile for me has been physical, rather than mental. My mind has always been there. It's the most powerful driving force within me � that image of being there, of not being disconnected. Do you think you'll ever make it home? For me it is a certainty. It is not a dream. What's the chance of restoring the monarchy? It is for Iranians to decide. As long as the next regime is based on democracy and human rights, the form does not matter. I have absolute conviction that a parliamentary monarchy is just as equipped as, if not better than, a republican system. But 95% of a future constitution would be the same, with all the checks and balances and principles built into the system. The tiny difference is whether you call the head of state Your Majesty or Mr. President.